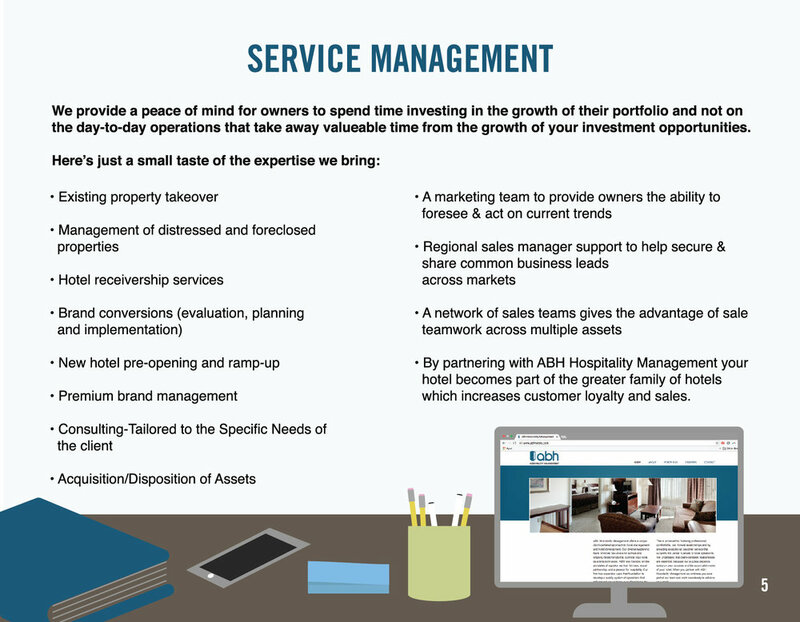 The team at ABH Hospitality Management came to me needing a fresh way to pitch potential clients and explain their business model in a short and sweet way. They were reaching a place where their current brand and website didn't quite fit their style or help them stand out from the competition. The new pitch deck needed to share how they worked in a easy to understand way (without being able to meet in person) and send well via email because often their potential clients just wanted a quick overview that could be shared to all shareholders quickly. After researching their field of work, scoping out the competition and wrestling with the content they needed to convey in a simple way, I developed a short infographic style pitch deck. With icons that matched the style of their logo and a fresh color palette we graphically explained the business of hospitality management and the benefits of working with the ABH Hospitality Management team.